Accidents don't wait for an appointment. This is something Dr. Ibrahim understands all too well. This is why Garden Grove Dental Arts offers the Orange County area's most comprehensive same-day emergency dental care services. Just call 714-537-5700 and be sure to tell the receptionist that your situation is an emergency. What should I do In case of a Dental Emergency? Immediately call Dr.Ibrahim at the main office number. If there are emergency non-dental injuries, or if you cannot immediately reach our office, then seek medical assistance at the closest emergency room. Make sure to leave us a message so that we can get you in to our office as soon as possible. What should I do if I have a broken tooth? Apply gentle pressure to the gums, not the tooth, to stop any bleeding. If possible, save any tooth pieces that have broken off. Call our main number as soon as you are able and identify your situation as an emergency. The sooner you can get in to our office the better, as it will give us the best chance to save as much of your original tooth as possible. We will do everything we can to make sure you are seen that same day. 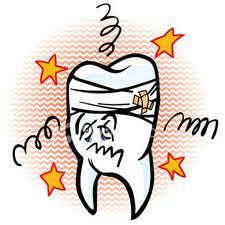 For more information on Same day Emergency Dental care, click here! Young teeth have special needs, making every child's tooth care especially important for healthy developing smiles. Dr. Marianna will discuss a care and prevention plan that addresses these special needs while promoting good dental hygiene for the whole family. When do children need to start seeing the Dentist? What kind of care do infants need? Good dental hygiene starts even before there are any visible teeth. Parents need to wipe the gums of infants with a damp soft washcloth after each meal and before bed. Once teeth emerge, parents should brush them with a soft toothbrush. To prevent tooth decay, no child should be put to bed with a bottle of anything other than water. A visit to Dr.Ibrahim is recommended before the second birthday. Ask her if a fluoride supplement is necessary. What kind of care do children need? Just like adults, children’s teeth need to be brushed with a fluoride toothpaste at least twice a day. Brushing before bedtime is especially important, but brushing in the morning and after eating is recommended whenever possible. Dr. Ibrahim suggests that you help younger children with their brushing until they are capable of properly doing it themselves. Use a soft-bristled toothbrush that is small enough to reach all their teeth. Replace it when the bristles start to wear. Try to minimize the amount of toothpaste children swallow. They only need a pea-sized amount on their brush, and they should be taught how to rinse and spit. Dr.Ibrahim recommends dental appointments for children every 6 months. These visits will include a thorough examination and a professional cleaning by Dr.Ibrahim. Children need to start flossing every night before bed once they get their permanent teeth. In their teen years, Dr. Ibrahim will discuss whether braces or extractions are recommended to keep teeth straight and uncrowded. Dr.Ibrahim may recommend fluoride supplements. Why is care and prevention important for children? Dental problems tend to get worse when left untreated. When your children see Dr.Ibrahim for regular visits, small problems won’t have a chance to become major concerns. Good hygiene and dental visits are cost-effective, too. It costs much more to have teeth repaired and replaced than it does to have regular exams and cleanings. My child can’t or won’t let a dentist get near their mouth. What can Dr. Ibrahim do? Fear of strangers is normal and healthy for children. You can help your child get past these common fears by bringing them to your own routine dental visit. When your child meets Dr. Ibrahim and watches you being treated, it can make it easier for them to get comfortable with their own visit. Dr. Ibrahim and the whole dental team are experienced at working with children, and they will do everything they can to put your child at ease and keep the experience stress-free. Sometimes the surface of a tooth becomes too badly damaged to be fixed with a filling or other dental technique, but the root structure beneath the gums is still strong. In this case, Dr. Ibrahim can cement a crown or “cap” on the old tooth. This crown will completely cover what is left of the existing tooth, and will be sized and shaped just like the original healthy tooth. 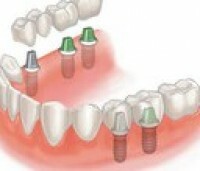 Crowns are made of different materials, and the circumstances of each patient will determine which material is best. This popular crown type provides an excellent combination of aesthetics and durability. The porcelain is color matched to your existing teeth and fused to a metal base. With a metal center, this type of crown can never match the translucency of a natural tooth or an all porcelain crown, and a thin darker line can develop where it meets the gum. 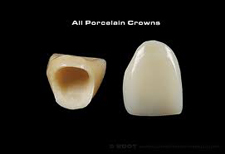 However porcelain-over-metal crowns look very natural and are exceptionally strong and durable. 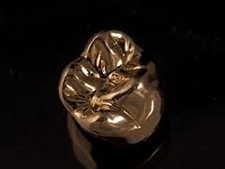 Gold is an excellent material for crowns because the material is extremely workable and provides an excellent fit between the crown and the existing tooth. Gold requires the least preparation of the existing tooth, keeping more of the original tooth structure than is possible with other methods. There is no possibility of gold crowns chipping, and since they are not as hard as porcelain crowns, they are not as likely to cause wear on other teeth. The downside of gold may be its distinctive appearance. In the back of the mouth, where gold is often used, this may not be an issue. 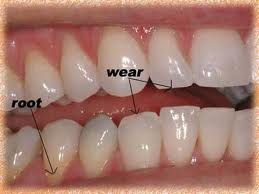 However, when it is visible in your smile, the gold crown will make an obvious contrast with natural teeth. Crowns are considered permanent dental restorations. With proper hygiene a dental crown will probably last from ten to fifteen years, but could last much longer. If you want to fill the space left by a missing or removed tooth, a dental bridge might be the solution you’ve been looking for. Within the walls of each tooth, a strand of dental pulp – the substance that supplies the tooth with nerves, nutrients, connective tissue and blood vessels – laces downward into the root. If the dental pulp becomes diseased, the pulp dies, cutting off the nutrients and nerve signals which the tooth needs to be healthy. If the diseased pulp is left in the tooth, the tooth will become infected, forcing it to be extracted. If you have one or more teeth that are healthy, but need some cosmetic improvement, you should talk to Dr.Ibrahim about veneers. People get veneers for a variety of reasons, but the result is always beautiful new teeth that make your smile more youthful and attractive. Lengthen and change the shape of teeth. Whiten stained teeth that resist conventional whitening. Improve the appearance of chipped, cracked or worn teeth. Protect teeth from further damage. Regular dental cleanings are part of a proper oral hygiene program. Cleanings help fight plaque, the major cause of tooth decay, gingivitis and serious gum disease. Why do I need regular dental cleanings? The fight against plaque is a major component of preventative care, and Dr.Ibrahim can be your main ally in this effort. While daily brushing and flossing are your first line of defense against plaque, the professional cleaning is more thorough than the brushing and flossing you do at home. Even proper brushing alone can’t remove the tartar that accumulates at the gumline. Good hygiene and regular dental cleanings are cost-effective, too. It costs much more to have teeth repaired and replaced than it does to have regular exams and cleanings. Usually an exam and cleaning are scheduled during the same appointment. Your dental hygienist is an expert at giving teeth this thorough regular cleaning known as a prophylaxis or “prophy.” Stubborn plaque and tartar will be removed with specially designed dental tools. Tartar is the plaque which has hardened at and even below the gumline. Your hygienist can clean tartar below the gumline as well in an intensive cleaning called Scaling and Root Planing. Often the last step in the cleaning is polishing. How often do I need Cleanings? Many adults require cleanings every six months. If your mouth is prone to tooth decay, tartar buildup or gum disease, Dr. Ibrahim will recommend more frequent appointments. Change the color of teeth. Whiten teeth that are too dark or stained. Bonding is typically a one-appointment process, but like most dental procedures your visit will probably start with an examination and any necessary cleaning. Dr. Ibrahim will then prepare the particular tooth or teeth by applying a very mild etching solution. This solution slightly roughens the surface of the teeth so the resin bonding material can attach with a very strong bond. A conditioning gel may be applied at this time. The bonding material is actually soft and flexible, and can be molded like putty or clay. It is a composite resin that will be colored to match the natural shade of your teeth. Dr. Ibrahim will mold and sculpt the resin to cover the affected teeth or replace the missing tooth structure. A high intensity light will be aimed at the sculpted bonding material, quickly turning it hard and durable. Often Dr. Ibrahim will repeat this procedure, applying multiple thin layers, so the entire procedure could take more than an hour. 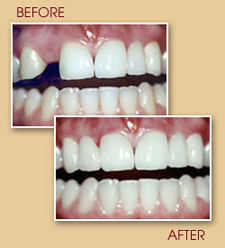 Once hardened, the bonded restorations are very strong, and will look and feel very much like your natural teeth. Finally, all new surfaces are smoothed and carefully polished. If you are looking for teeth whitening in Orange County, Dr. Ibrahim is the answer to your search for a whiter, brighter smile. Everyone wants a whiter and more attractive smile, but for most people, bleaching toothpastes and over-the-counter whitening kits just don’t produce the long-lasting whitening effect that professional teeth-whitening services do. Give us an hour of your time, and you’ll see what a dramatic impact your visit will have upon your smile. We promise the improvement will not go unnoticed, and you’ll make a visit to our offices a regular part of your dental routine. There are a number of reasons that even healthy teeth can become dull and stained over time: haphazard dental hygiene, coffee, tea, red wine, cigarettes, and even age are just a few of the common contributors to a smile that isn’t looking as good as it should. Minerals, food particles, and staining agents penetrate the surface of the enamel that covers a tooth, leaving a permanent discoloration that can become more severe over time. While over-the-counter toothpastes and bleaching kits may help, they don’t have the same dramatic effect you’ll get from a visit to the dentist, and many spend hundreds of dollars on ineffective products each year. For pain-free and effective teeth whitening in Orange County, a visit with Dr. Ibrahim is bound to make you a lifelong fan of the procedure and the fantastic results you’ll see following just one visit. There are a number of methods used to whiten teeth, but the most common involves applying a peroxide-based bleaching gel directly to the surface of the teeth. When the gel mixes with oxygen, it whitens the surface of the tooth without damaging the structure, giving you the smile you desire without any unwanted side effects. Call today to schedule your appointment, and see what a whiter and more confident smile can do for you! A cavity is tooth structure that has been weakened by decay. When Dr.Ibrahim removes this decay, she replaces the removed structure with a filling to protect and retain the structure of the tooth. It is called a filling because it fills the space where the decay in the tooth has been removed. When Dr. Ibrahim removes tooth decay, she replaces the removed structure with a filling to protect and retain the structure of the tooth. 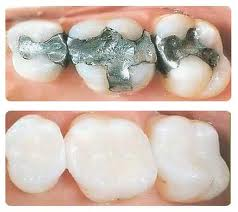 Traditionally, dentists have used metal amalgam fillings for this purpose. Cosmetic fillings, also known as Composite fillings or Tooth-Colored fillings, are a tooth-colored alternative to traditional amalgam fillings. They are made of a composite plastic resin, and they look just like natural teeth. Amalgam fillings are much darker than natural tooth structure, so they stand out in sharp contrast with the color of your teeth. This is sometimes called the metal-mouth look. 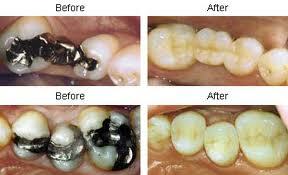 Amalgams can corrode, leak and expand over time, potentially weakening teeth and eventually lead to tooth frature. Additionally, many are now concerned over the health consequences of mercury content in amalgams. The most obvious advantage of the cosmetic fillings is that they are nearly invisible in your mouth. They won�t stand out as dark spots in that beautiful smile you�ve been working hard to get. Cosmetic fillings bond very tightly to your existing teeth and work extremely well for small cavities. There is obviously no danger of metal-sensitivity. Anyone who has a filling in their mouth or needs a cavity filled should certainly ask Dr. Ibrahim about cosmetic fillings. They are strong and durable and look almost invisible. If you want the very best for your smile, then you want to use materials that appear very natural and tooth-like. That is exactly what cosmetic fillings were designed for. 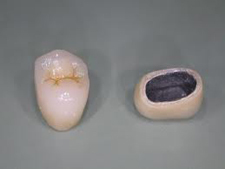 It s very likely that you can, since removing the old amalgam is usually a quick and easy procedure. Dr. Ibrahim will have to examine the tooth structure under and around the old filling to see if more extensive dental work is necessary, but if not, she can give you a new cosmetic filling in the same appointment. 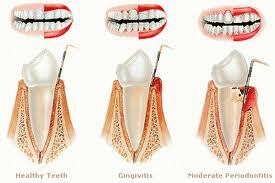 Gingivitis is an inflammation of the gums that is usually caused by plaque. It is the earliest and most easily treated from of gum disease, as it only affects the gums, but it must be treated to avoid more serious gum disease..
You can reduce the risk of Gingivitis by brushing and flossing regularly, quitting tobacco use and by making regular dental visits for examination and cleaning your teeth..
What can Dr. Ibrahim do about Gingivitis? Dr. Marianna will give your mouth a thorough examination to see if any of your teeth or dental work has rough edges that are contributing to this problem. You will receive a thorough cleaning above and below the gums. This will usually include a process called scaling, where the dental professional uses instruments to scrape the tartar off teeth below the gumline. Scaling is followed by a smoothing procedure called planing to make sure there are no rough surfaces to continue irritating the teeth. Dr. Marianna can further describe the procedure and the techniques for making patients completely comfortable during the appointment. Periodontitis is advanced gum disease. While gingivitis (the earlier stage of gum disease), affects only the gums, periodontitis is inflammation and infection that has spread to surrounding tissue, including tooth and bone and systemically then travels throughout your body. What can Dr. Ibrahim do about Periodontitis? As with a case of gingivitis, you will receive a thorough cleaning above and below the gums. This will usually include a process called Scaling and Root Planing (Deep Cleaning), where the dental professional uses instruments to scrape the tartar off teeth below the gumline. Scaling is followed by a smoothing procedure called Root Planing to make sure there are no rough surfaces to continue irritating the teeth. She can further describe the procedures and the techniques available for making patients comfortable during the appointments. Periodontitis is the major cause of adult tooth loss. Not only are your gums, teeth and the bones of your jaw at risk, but the infection and bacteria from periodontitis can lead to heart disease and stroke, and pregnancy complications. Inhaling bacteria from your mouth can also cause Pneumonia. If you have any symptoms of gingivitis and periodontitis, contact Dr. Marianna for a thorough examination and treatment. Early detection is the key to successful treatment of oral cancers, so Dr. Ibrahim is the first line of defense. Ask her about oral cancer screening at your next regular visit. How can Dr. Ibrahim help? Dr. Ibrahim is the first line of defense because regular dental visits are an opportunity to thoroughly examine your mouth. Not only are regular dental visits part of the good oral hygiene that reduces the risk of oral cancers, but dentists are often the ones who detect oral cancers first. Ask Dr. Ibrahim to discuss oral cancer screening with you at your next visit. There are many possible causes for a Toothache. 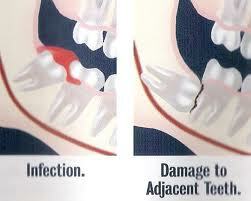 Two of the most common dental causes are the presence of a cavity or an abscess. Some of the other causes of toothache are quite serious, so you should certainly consult Dr. Ibrahim for a proper diagnosis. A Cavity, or Caries, is a hole in a tooth that is caused by tooth decay. If you experience pain when eating something cold or sweet, and the pain goes away fairly quickly, you may have a cavity. If it is a cavity, the sooner you get it taken care of, the less severe the damage will be. See Dr. Ibrahim for proper diagnosis and treatment. First, the toothache could be a sign of a non-dental problem, and not a problem with the tooth itself. If the problem is with the tooth, early treatment is important, because Dr. Ibrahim wants you to keep as much original tooth structure as possible. An early cavity can be filled before the tooth abscesses and needs a root canal. An early abscess can be treated with a root canal, instead of tooth extraction. A tooth that is too far damaged and infected may have to be extracted to prevent further damage to the mouth, and extraction is always Dr. Ibrahim�s last resort. Tooth Sensitivity is a very common problem that can be treated effectively by Dr. Ibrahim with different products and techniques. The sensitive parts of the tooth have been exposed due to damage to the enamel or recession of the gums. The enamel on the outside of your teeth, the hardest substance in your body, protects the inner sensitive part of your teeth. Sometimes this enamel gets cracked, worn or decayed. Your gums also protect the sensitive roots of your teeth by forming a tight seal where the gums meet the teeth. Gums sometimes recede from their natural position and expose the roots of the tooth. 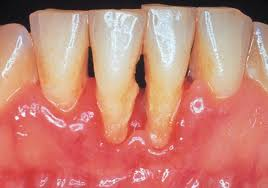 Typical causes for this recession are gum disease, or even just brushing teeth too hard and vigorously, or clenching a bad bite. If your brushing is forcing your gums to recede, you need to discuss proper brushing technique with Dr. Ibrahim to prevent further damage. Special tooth pastes can help sensitive teeth by either desensitizing the tooth or by filling the tubules in the dentin that are exposing the nerve. These toothpastes typically take at least a month to work. Visit Dr. Ibrahim for a thorough examination and for a recommendation of products. .
Bruxism is either the clenching or grinding of teeth, or both of them together. It is usually a greater problem at night when one is unaware that they are doing it. Often the patient�s partner will be the first to notice it as they can hear the noise coming from the other side of the bed. 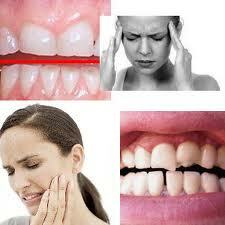 It is commonly believed that this subconscious nighttime bruxism is due to stress and anxiety. It also could be a bite problem. h2 class="green">What damage does Bruxism do? Grinding can damage teeth by scraping and wearing away the surface. This can be cosmetic problem, as teeth shorten and change shape, and can lead to sensitive teeth as the enamel becomes worn. Clenching can cause muscle strain and fatigue, earaches and headaches, and put severe stress on the hinge of the jaw, the temperomandibular joint. How can Dr. Ibrahim treat Bruxism? Dr. Ibrahim will give you a thorough examination to see if your teeth or dental work has been damaged by the bruxing. Though there is no sure treatment for bruxism, it has been positively linked to stress and anxiety. Dr. Ibrahim will probably suggest modifying your behavior to bring down the stress in your life. To prevent damage to your teeth, she will prepare a custom-fitted plastic appliance (NIGHT GUARD) for you to wear when you sleep. This won�t stop the bruxing, but the plastic of the appliance will prevent your top and bottom teeth from contacting each other. Wisdom teeth are the third and final set of molars that emerge, usually during your late teens to early twenties. For some people the wisdom teeth emerge through the gums and have enough room to grow in naturally. For others, wisdom teeth often cause problems as they are trying to protrude through the gums. When a wisdom tooth is impacted the tooth is coming in at an angle and not straight through the gum line. This can cause pain, the tooth can come in unevenly, or the tooth may only emerge partially. Impacted wisdom teeth can cause structural damage to the jaw and other teeth. They can also provide a place for bacteria to gather since they are hard to reach and clean. These potential problems make it necessary to remove impacted wisdom teeth so that larger problems do not arise. Routine x-rays during a dental exam can reveal if you will need to have your wisdom teeth removed. Complete Dentures - This restoration method is used to restore your smile and mouth function if all your teeth have been lost. The dentures are custom created to resemble natural teeth and are positioned into a patients mouth to take the place of where the teeth used to be. 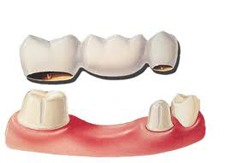 Complete dentures are removable and can require adjustments in order to create a proper fit with the gums and mouth. NWhen cared for properly, implants should last a lifetime. Proper oral hygiene and regular dental visits are essential to the success of your implant.